Polybutene (PB-1), like polyethylene and polypropylene, is a polyolefin or saturated polymer that is expressed as CnH2n. PB-1 combines the typical properties of conventional polymers with some characteristics of technical polymers. PB-1 is used as a pure resin at the expense of metal, rubber and Engineering Polymers, it is also used synergistically as a blend component to improve and differentiate the properties of other polyolefins. A major application area for polybutene resins is seal-peel or easy-open packaging. Typical examples include carton liners (e.g. cereal packaging) and packs for pre-packed delicatessen products like cold meats, cheeses and smoked salmon. PB-1 offers the ability to customise sealing temperatures and seal strength whilst giving consistent, reliable processing and sealing performance on existing equipment, and built-in tamper-evidence. PB-1 can also be used in film modification to increase flexibility and softness without sacrificing clarity. In a similar vein, PB-1 is used to modify polypropylene fibres to enhance softness, flexibility and to provide a unique feel. PB-1 is also used commercially in films that require creep resistance such as insulation compression packaging. It can also be used as a layer or overall film for hot filled heavy duty packaging, tapes for bundling and holding loads at elevated temperature such as bale wrap, speciality sheet applications such as anti-erosion geo-grids and netting and cable ties. PB-1 features in hot melt adhesives, where its unique crystallisation behaviour reduces the melting point and extends the "open time" of the adhesive to as much as 30 minutes, to enable time for repositioning of components prior to setting. 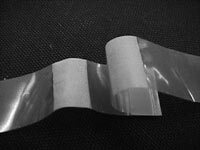 It is used widely as a component in hot melt adhesives for non-woven fibre webs. PB - 1 is available in a number of different grades dependent on the application and chosen processing method. PB-1 is also typically used in applications that see continuous load at moderate to high temperatures. It is used in electric domestic heaters in North America, where it is blow moulded into large 15-20 kg tanks. Other logical extensions may include fire extinguishers, residential and swimming pool water filter housings, pressurised pneumatic holding tanks, hoses, compressed gas cylinders and aerosol dispensers, to name just a few. There is also considerable interest in the potential of PB-1 to be used as a component in synthetic wine corks. PB-1 is also employed in compounded polymer products to provide unique benefits. It accepts extremely high filler loadings (>70%), which combined with its low melting point, enables it to be used in halogen-free flame retardant composites or as a masterbatch carrier for difficult-to-disperse or temperature-sensitive pigments; its unique rheology and concomitant easy dispersability enable it to be used at very low levels in other polyolefins as a processing aid to reduced extruder pressures and/or increase extruder throughput. In Europe and Asia, PB-1 has been developed over the past 30 years to be arguably the technically preferred material for hot and cold water plumbing and heating piping systems. Pipe system manufacturers state that piping systems made from PB-1 offer easy, fast installation with a reduced number of joints and connectors compared to much stiffer conventional plumbing materials. In service, they note that the piping does not corrode or fur up in hard water areas, it does not split at sub-zero temperatures and is quieter in use as it does not suffer from "water hammer". It is used both in the construction of new buildings and the renovation of older properties. A major UK housebuilder uses PB-1 piping systems exclusively in all its new properties. Basell's PB-1 is not being sold in pipe applications intended for use in North America. Use of PB-1 in Biomass-fired District Heating Network. The Installation for the Network was just 10 weeks due to the simple, safe and speedy installation procedures of the PB-1 Piping System. PB-1 requires less energy input in extraction, conversion and manufacturing than copper and also remains more efficient in service as it does not attract limescale build up. Additional benefits include ease of installation, light weight and flexibility. PB-1 may be utilised to produce a seamless blow molded tank with no anode rod required for a corrosion free life. Extreme weather conditions made this project presented major challenges. Tests revealed that no negative effects would result from the piping system if an all PB-1 system was installed. Energy Saving Measures taken in renovating a small country houde in mid-Wales, have helped win the new Green Tourism Award. PB-1 was first synthesised in 1954, one year after polypropylene. It took another 10 years until Chemische Werke HÜLS, Germany, started the first industrial production in 1964 (capacity: ca. 3 kt/a). Vestolen BT was introduced to the market. Independently, Mobil Oil in the US developed their own PB-1 process technology and built a small industrial plant in Taft, Lousiana, in 1968. In the early 70's the plant was taken over and operated by Witco Chemical Corporation. In 1973 HÜLS withdrew Vestolen BT from the market after some manufacturing issues in their polymerisation plant. At the end of 1977 Shell Chemicals USA, a subsidiary of Shell Oil Company, acquired the PB-1 business from Witco, including the Taft plant. Shell then started a major investment program to improve the product quality and to increase the production capacity to about 27 kt/a.